Every December, members of the United Chiropractic Association (UCA), including our very own Drs Glenn and Laura, donate a day’s work by providing chiropractic adjustments in exchange for food parcels. One in five people in the UK – that’s around 13 million – are now living below the poverty line and 1 in 5 parents have skipped meals or gone without food so their children can eat. If you’re booked in for an appointment with Glenn or Laura on Thursday 1st December, instead of payment, we ask that you bring in a food parcel to the value of your adjustment visit. This will then be donated to the Shrewsbury Food Bank in time for Christmas. DO YOU HAVE A FRIEND OR FAMILY MEMBER THAT COULD BENEFIT FROM CHIROPRACTIC? You are therefore invited to make an appointment to see Glenn or Laura on Thursday 1st December and, whilst you’re here, join us for a hot cuppa and a chat. 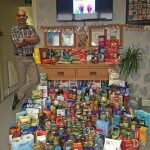 Shrewsbury Food Bank Plus not only provides food parcels to those in need but offer so much more, from teaching people how to cook and grow vegetables, to money advice and support to help people help themselves in the long term.